Being from the great Midwest state of Nebraska, there are two things that are certain…college football and Runza’s! You basically cannot have one without the other. Now, technically these are most often called Bierock’s and are of a Russian/German background ..there’s that German in me again. However, Nebraska has made these bad-boys a delicacy due to its chain of famous Runza’s Restaurants, established back by a brother and sister in 1949. In your stand mixer bowl, add the yeast packet to the 2 cups of warm water, stir to dissolve. Let sit for 5 minutes. Now with the bread hook attachment, mix together the yeast, sugar and 2 cups of flour. Beat until smooth. Add eggs, oil and salt. Gradually add remaining flour and beat for about 5 minutes, until all is combined. Dough will be soft. Pour dough into greased bowl. Cover with towel and let double in size in a warm place. This will take about 2 hours. Brown your hamburger, 1/2 of the chopped onions and a hefty pinch of both salt and pepper in a large skillet. Break up the beef very well. Next, steam the cabbage and remaining onion by adding both to the meat-filled skillet, add water/cover and steam for 10 minutes, or until cabbage and onion are soft. Turn off heat. Mix in the Worcestershire and oregano, taste for more salt & pepper. Let cool. Turn dough onto clean work surface, add a bit of flour to your surface and rolling pin if needed/dough is sticky. Knead for a minute. Cut into about 12 ‘chunks’, working with one at a time. Roll each chunk into either a circular or rectangle shape, about 1/8th of an inch and 6″-8″ around *there is no wrong or right as it all taste delicious! In the middle of each rolled out piece of dough, lay a slice of American cheese down. Top with a hefty 1/2 cup+ of filling and similar to a burrito, fold edges over and pinch together. Place filled pockets, seam side down, onto parchment paper lined cookie sheets. Cover the two baking sheets of filled Runza’s with a tea towel and, again, keep in a warm place for a second rise for about 15-30 minutes. Finally, place into your preheated oven, 400 degrees, for 20 minutes till golden brown. Let cool for 5 minutes and enjoy with some crinkle cut French fries and ranch! Enjoy! *The leftovers can be frozen and even cooked straight from frozen! Yay! Place on a lined cookie sheet for 45-50 minutes at 325 degrees! Growing up in a Midwest family meant we ate lots of beef, steak preferably. Steak for Sunday supper, steak for birthday’s, steak for holidays. It’s just a way of life…however, we NEVER served our meaty meal with the famous A-1 Steak Sauce. Uh-uh, no way José. One could never treat that delicious slab of beef in such a manner. That being said, I still did like the poor victim of A-1 in our household (I always wondered why we had it too, given we weren’t allowed to use it for its intended purpose?). So I would always use the steak sauce to dip my French fries in, as I loathe ketchup. Now years later, as an adult myself, I too do not allow A-1 to be used on my delicious, perfectly seared steaks. Apparently that rule is inherited, perhaps genetic? So to use up my random bottle of perfectly tasty A-1, I thought I’d make it into a meatloaf recipe. I mean ground beef is yummy, but it isn’t a steak, so this is justified in my opinion. 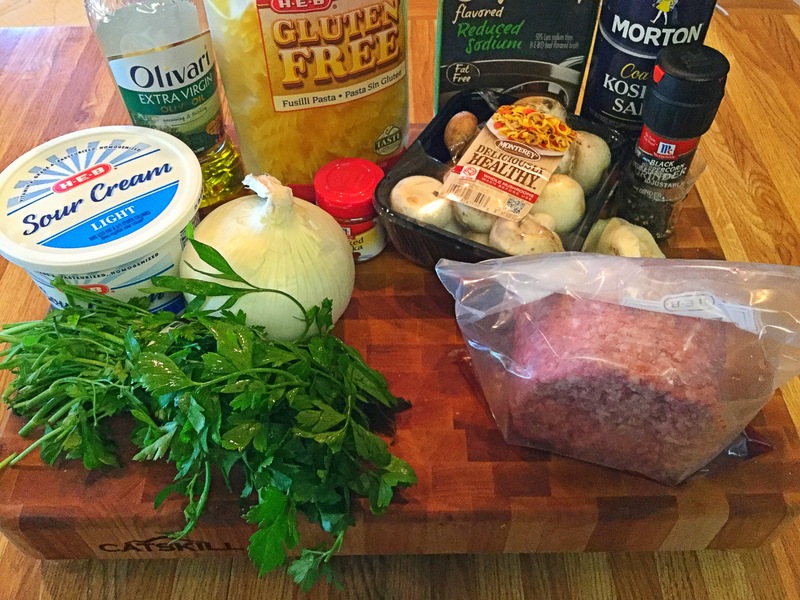 …and yes, this meatloaf is glorious! 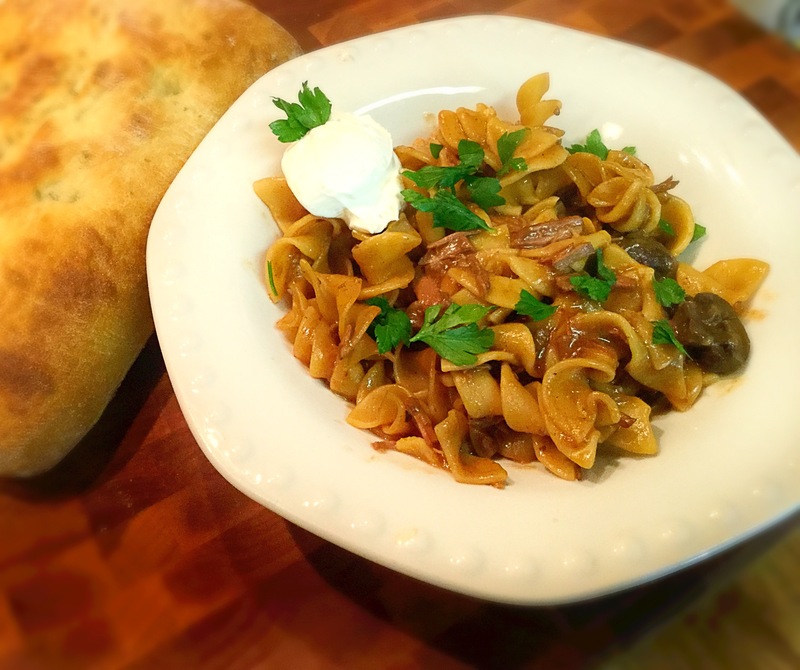 Hearty, beefy with a slight bacon flavor and the fried onions at the end give a great crunch! Most importantly though…that A-1 sauce has now served a purpose in this family’s life! Preheat your oven to 350 degrees and lightly grease your favorite meatloaf pan. Heat a skillet over medium-high heat and cook the chopped bacon until just barely cooked and still a bit soft. Transfer to a large bowl, but keep the bacon grease in the skillet. To that bacon grease, toss in the onions and cook down for about 5 minutes. Add in the garlic for another 60 seconds. Pour this into the large bowl with the par cooked bacon. Next, to the bowl of onions and bacon, you add in the remaining ingredients: Ground beef, the oatmeal soaked in milk, 3/4 cup of A-1 Steak Sauce, eggs, Worcestershire sauce, Montreal steak seasoning and salt & pepper. 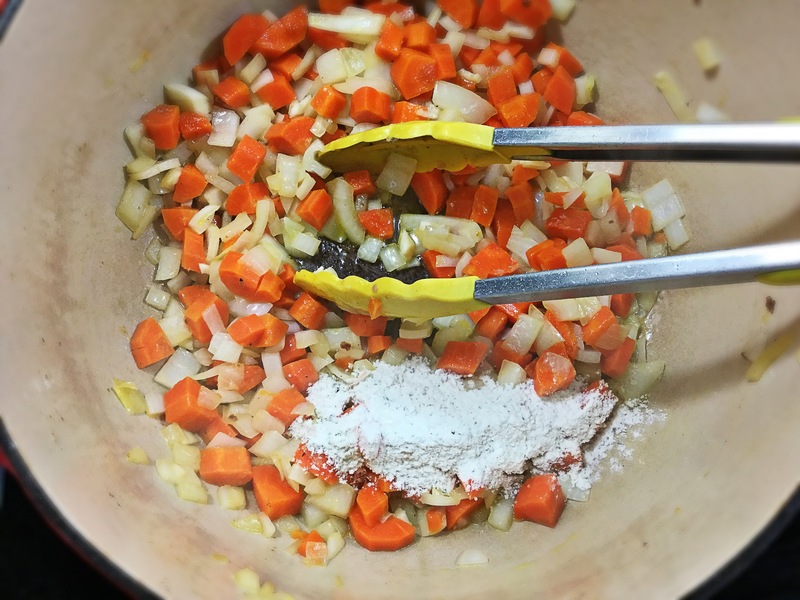 Mix thoroughly with your hands and shape the meat into a loaf/into your loaf pan. Top with the remaining 1/4 cup of A-1 Steak Sauce. Bake at 350 degrees for 45 minutes or until the internal temperature reaches 160 degrees Fahrenheit. Allow to rest for 5 minutes, slice and serve with the French fried onions overtop along with mashed potatoes and your favorite vegetable. Enjoy! 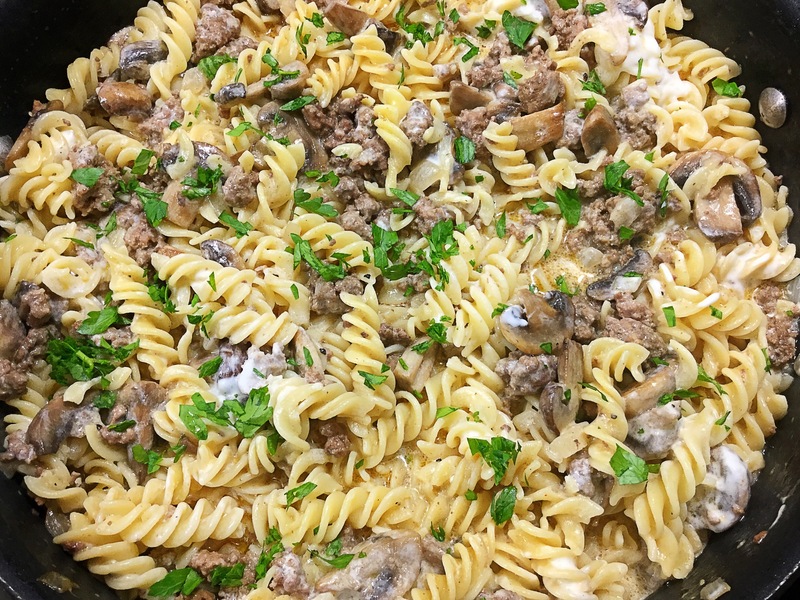 This rich and hearty dish may be foreign and unheard of if you are not of German heritage or frequent European inspired restaurants. Now being German myself and growing up attending Oktoberfest while eating sausages, kraut and warm, soft Bavarian pretzels in loads of beer cheese…I simply adore Rouladen. Not because we had it often, rarely ever, but because it was mainly served as a Christmas dinner dish or perhaps a Sunday supper if you were lucky. It’s a special treat, where it takes a bit of thought and tedious work in assembling, twining, searing and braising the beef…but oh-so worth it! Another reason that many ‘non-Germans’ may have not tried this specialty dish is because the ingredients could sound a bit odd together. I get it. Rouladen usually consists of bacon, onions, mustard and pickles wrapped in thinly sliced beef which is then braised until the beef is about fork tender. Yes, we like a bit of ‘saur’ to our meals, but this works wonderfully….and oh that bacon!! 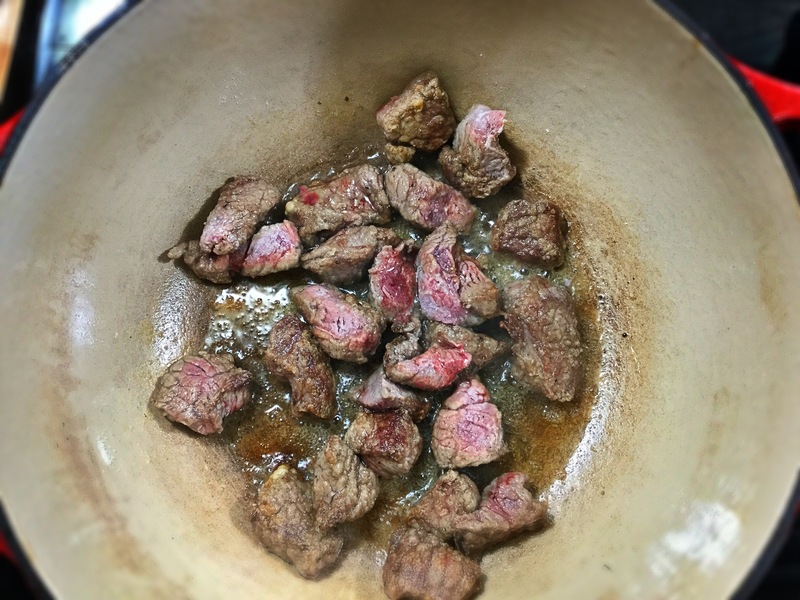 It cooks inside the beef, which in turn actually bastes itself and creates SUCH a rich flavor and tender meat!…drooling now. Beef, thinly sliced and pounded 1/4″ thin to about 4″x6″ (chuck roast or top round slices). I typically use about 8-10 slices. 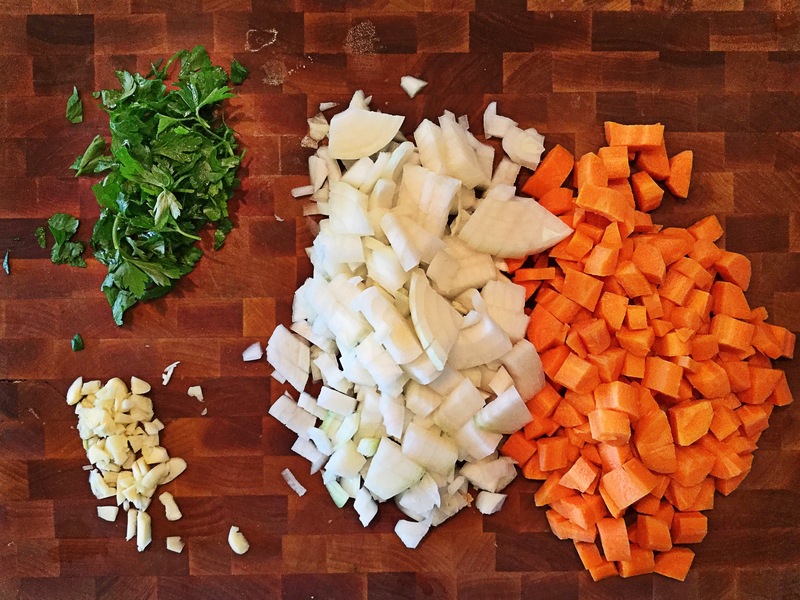 The “hardest” part of this recipe is the assembling…once you get everything prepped (chopped, diced, rolled and secured) you’re in the clear and can enjoy a German bier while smelling the braised goodness! 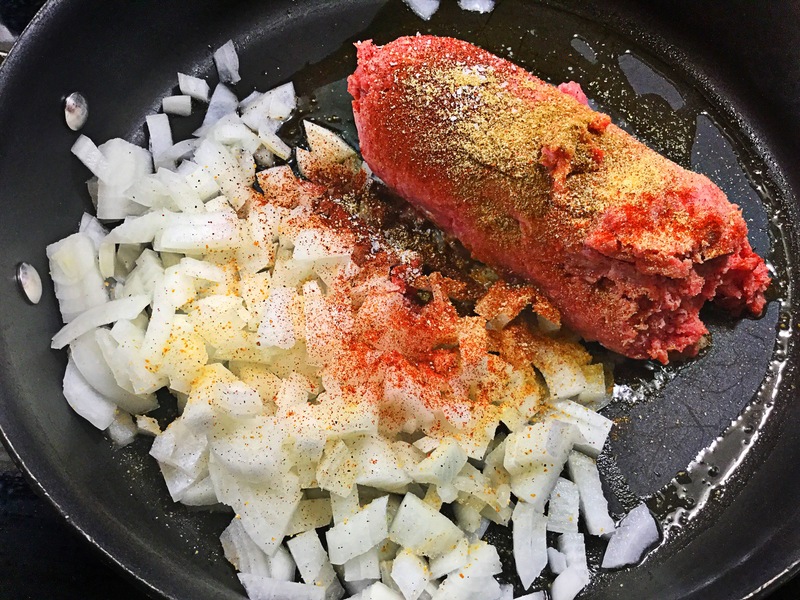 When everything is in it’s place, begin by spreading about a tablespoon of the mustard on one side of the thinly pounded beef, sprinkle with a bit of salt and pepper (easy on the salt). Next lay 1-2 slices of bacon down lengthwise, followed by the onions, the sweet relish and finally the dill pickle slice horizontal to the length. Roll up each prepared beef slice around that dill pickle and secure (as best you can) with the butcher twine or a bevy of toothpicks. In a large heavy bottomed pot or Dutch-oven (I used my enameled Lodge cast-iron), add in the reserved 2 slices of chopped bacon and render the fat over medium heat. When bacon is slightly crisped add in the rolled and secured Rouladen (about 1/3 – 1/2 the batch at a time) and brown all sides to create almost a crust. Remove the seared beef rolls and continue with the rest of the batch (should take about 20 minutes for all). To that bacon/beef grease (you may need to add 1 Tbsp more of vegetable oil depending), add in the carrots, onions and celery and allow to sweat down for 2-3 minutes, scraping the bottom of the pan with a wooden spoon. 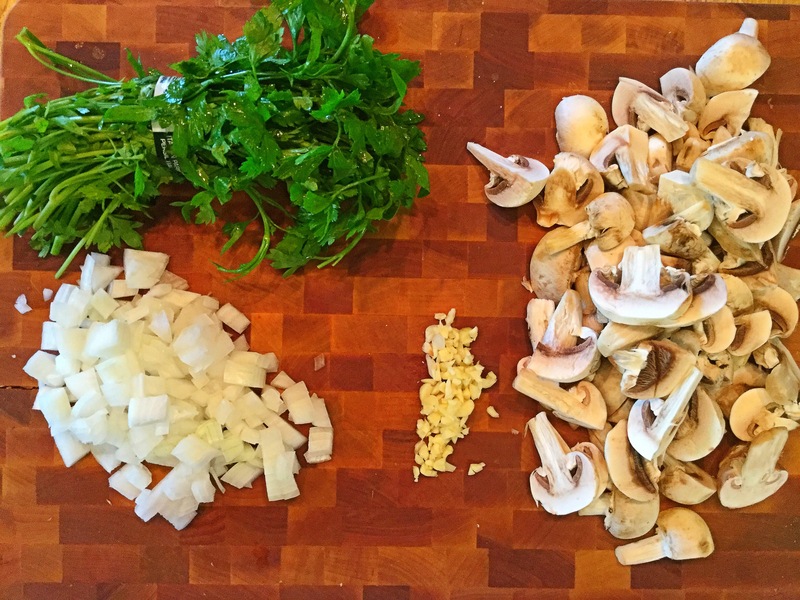 Add in the garlic and sauté for 30 seconds. Next, pour in the red wine, again scraping the bottom of the pan for any brown bits…flavor!! and simmer, stirring for 4-5 minutes. Add the seared Rouladen back into the pot with the veggies/wine and pour in the beef broth till it covers about 2/3rd the way up the meat. Bring to a boil and then cover and let simmer on low for 1 1/2-2 hours. Once finished, carefully remove the tender beef rolls to a platter. Mix 1/4 cup of flour with 1/4 cup milk and whisk into the juices in the pot. This will thicken and make a gravy. Now, optional, you can whisk in the sour cream for more richness and a slight tang that the Germans love in their cooking. To serve: Thoroughly remove the butcher twine or toothpicks and place Rouladen on a plate, cover with a hearty amount of the gravy and serve with warmed German cabbage and boiled dill-flavored potatoes to help sop up that gravy with! Prost!! After a long summer, which seemed to extend into our Fall..dang it was unusually warm..we finally have that chilly, rainy day. I’m sure sooner than later I’ll be far over having to get bundled up, but as of now bring on the fireplace, snuggly blankets and movies! After a long day of said movies on the couch, I apparently get pretty hungry (hard work right?) and crave a big ol bowl of comfort to keep the day going. Well, this does the trick! 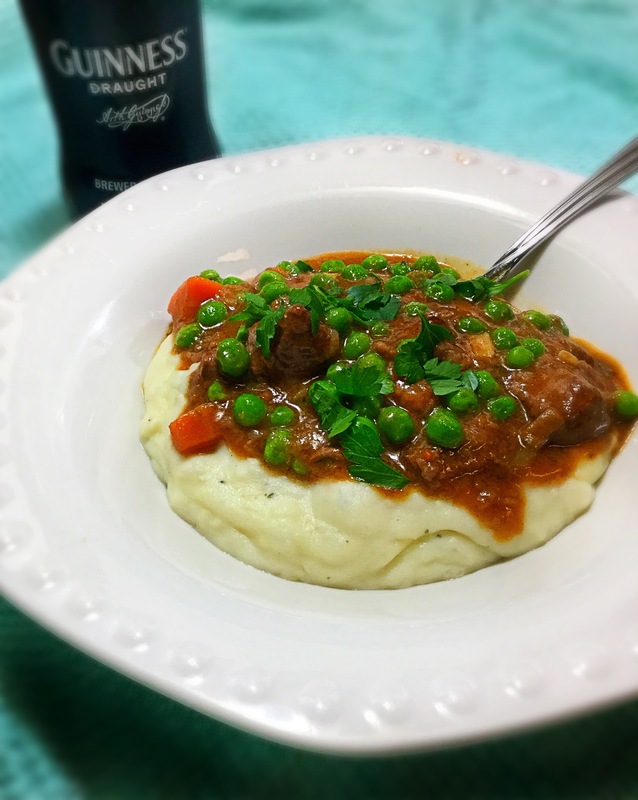 This rich and flavorful stew will thicken as you cook (hence the quick flour step you’ll see below), so please take that extra minute to sear the meat and saute the vegetables for that added creaminess and flavor! 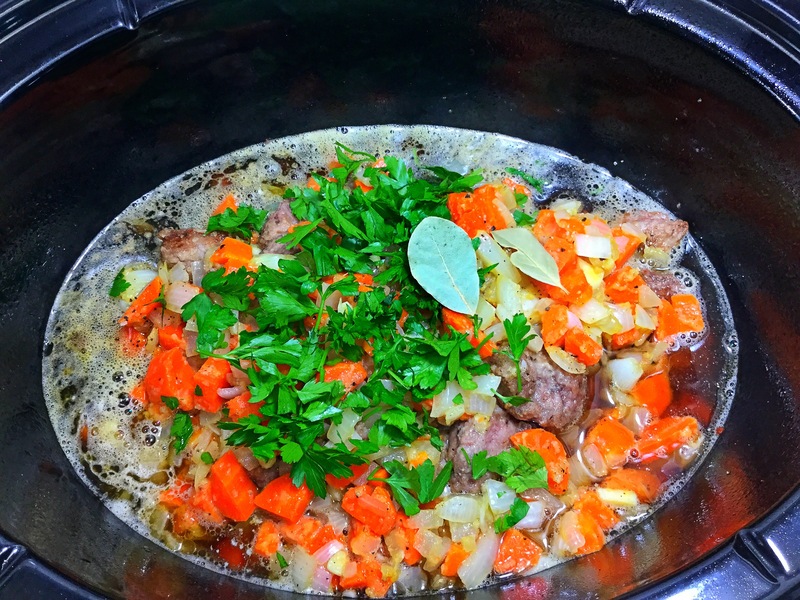 You can of course cook this all in a Dutch oven on your stove top, it will be done a bit quicker if so, but I just love my slowcooker and the ease of walking away ALL day..errr…laying on the couch. Begin by heating 2 Tbsps of canola oil over medium heat in a large heavy bottomed pan, while spraying your slowcooker with non-stick spray. The oil will take a few minutes to heat up, so meanwhile cut and chop up those veggies and herbs. 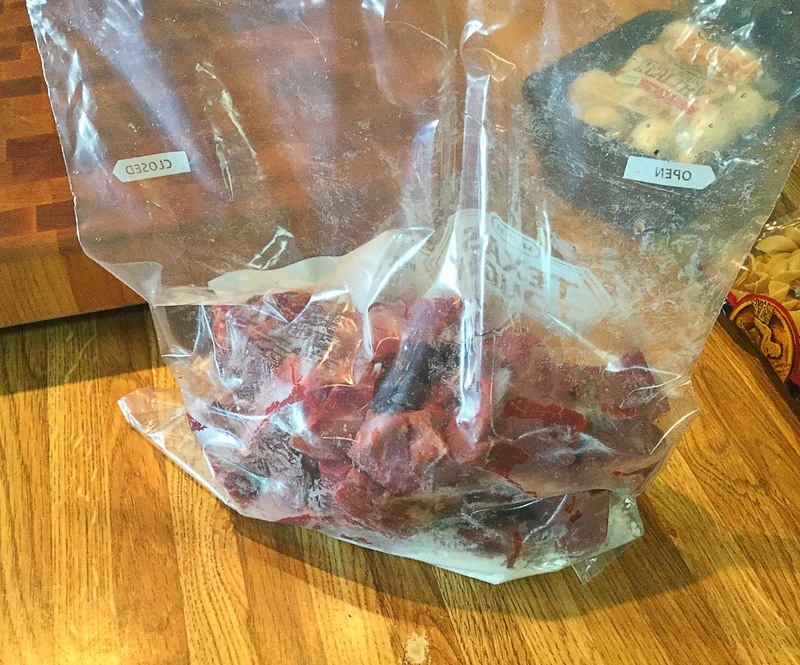 Also, in a gallon size ziplock bag or large bowl, coat the beef stew meat with the flour and salt and pepper to taste. Next, add the flour-coated meat to the hot pot and sear all sides. You will need to do this in about 4 batches as you do not want to overcrowd the pot. That will steam the meat instead of giving it that nice crusty sear. *Please KEEP the remaining Tbsp or 2 of seasoned flour thats leftover from the meat/ziplock bag. Once each batch as finished searing, transfer to the slowcooker. *You will likely need to add another Tbsp of canola oil in between batches. 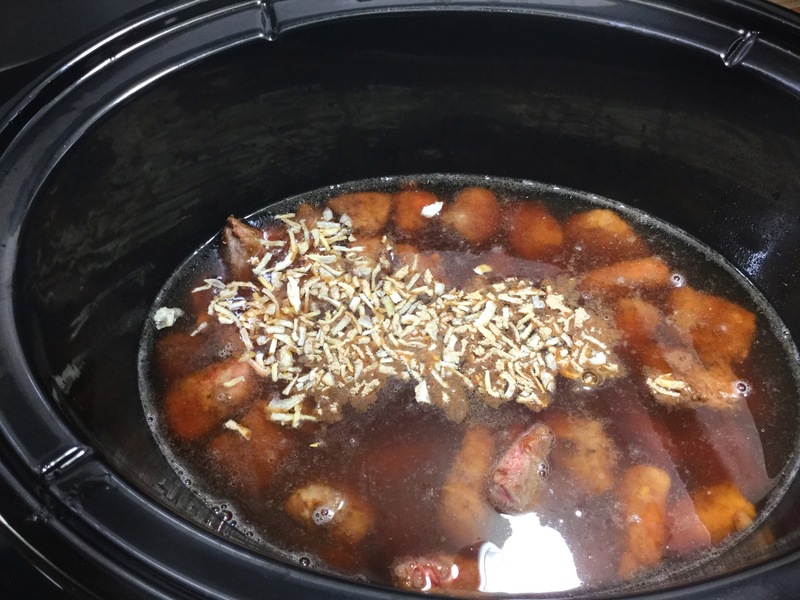 Now that the meat is done and in the slowcooker, toss the cut carrots and onion into the still hot pan with again, another tbsp of oil if needed. Saute the vegetables for 5 minutes and then add in the garlic for 1 minute. 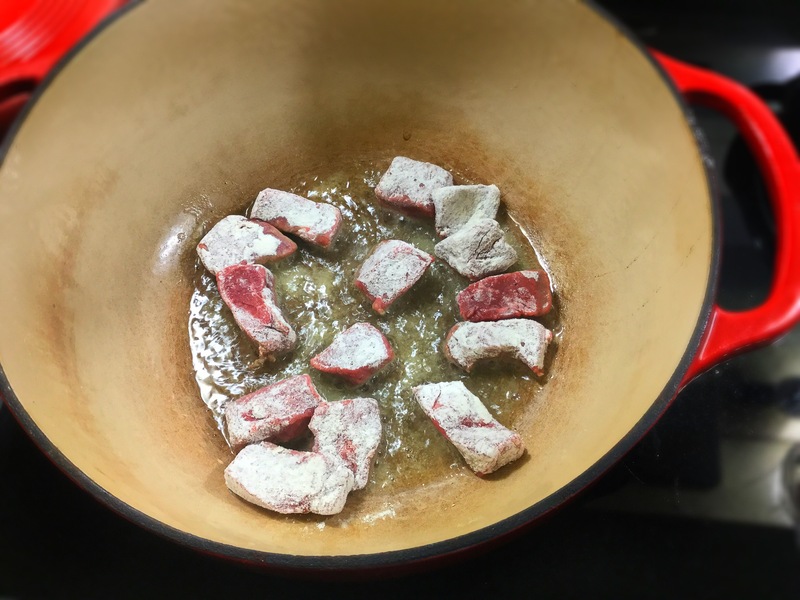 NOW, after you’ve swirled that garlic around a bit, pour in the leftover seasoned flour from the ziplock bag that the meat was in. Toss to coat and pour all of this mixture into the slowcooker with the seared meat. 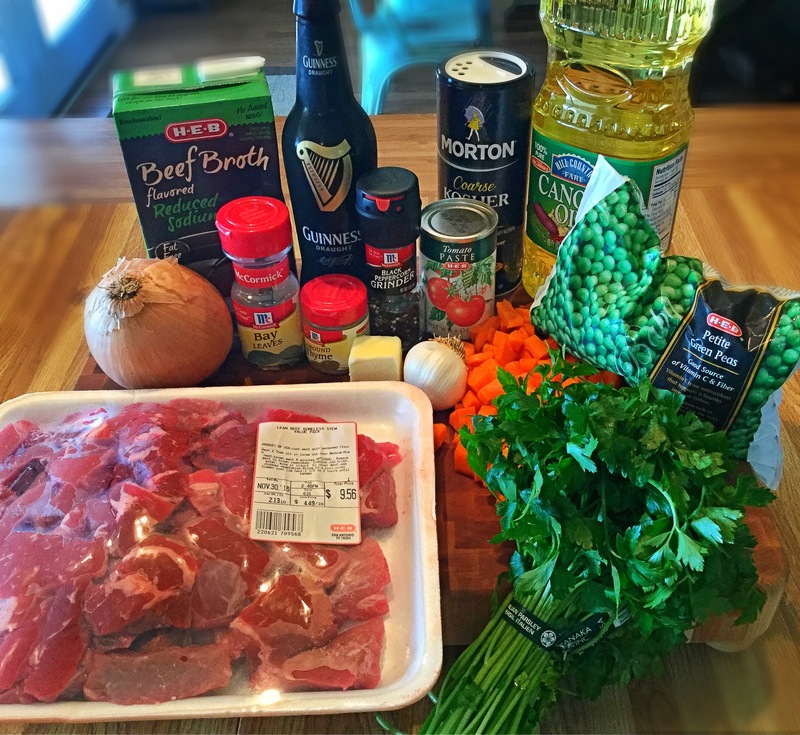 Along with the vegetables and meat, pour in the Guinness beer, beef broth, tomato paste, thyme, chopped parsely and bay leaf(s). Stir and cover, set to low for 8 hours. About 30-60 minutes prior to time, add in the frozen peas. Recover and allow to cook. Now that it’s close to dinner time, prepare your yummy mashed potatoes (I was gluttaonous and used a stick of butter, half-in-half and a head of roasted garlic..yummmmm!!). Serve a large ladle of the rich stew over your creamy mashed taters, top with a pinch more of fresh parsely, salt and pepper and a nice cold Guinness! Enjoy!! ‘Tis the season for hearty fare! Growing up we ate quite a few crockpot meals and my favorite ones contained the soft egg noodles that still kept a bit of chew to them. For the most part they’re commonly served with either chicken or tuna recipes, but why leave out my favorite??…beef! The slowcooker makes the cut up roast so very tender and who doesn’t love not having that extra step of boiling noodles?! *I garnished ours with a bit of chopped Italian flat leaf parsley for freshness and a spoonful of sour cream for extra creaminess..completely optional though! However, promise me you won’t forget the bread and butter!! Begin by simply adding the cubed roast to a gallon size ziplock bag along with the flour and the salt and pepper; shake to coat. Heat a pan and the canola oil to medium heat. Add the coated beef (in batches/do not overcrowd your pan, this will take 3-4 batches) to the heated pan and sear each side. Once the meat has seared, add to your slowcooker. 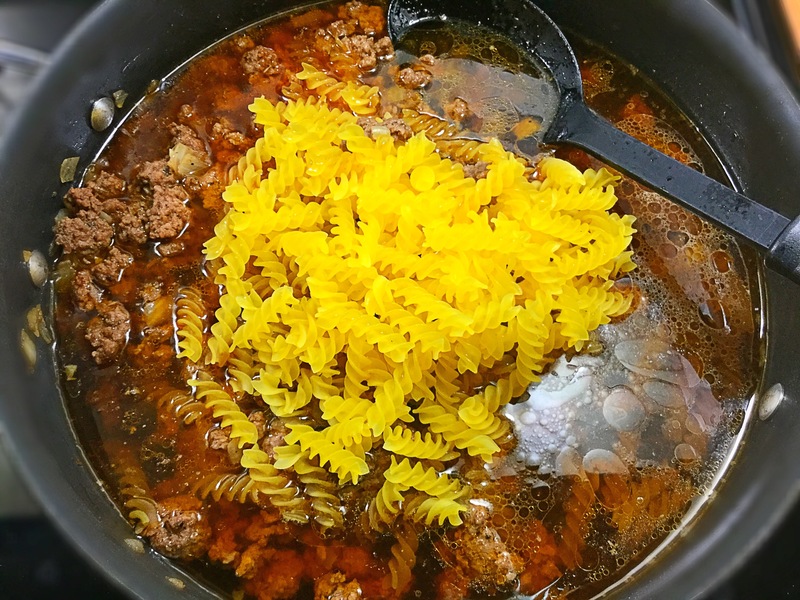 To that slow cooker, simply add in the remaining ingredients EXCEPT the noodles, cover and cook on low for 8 hours. 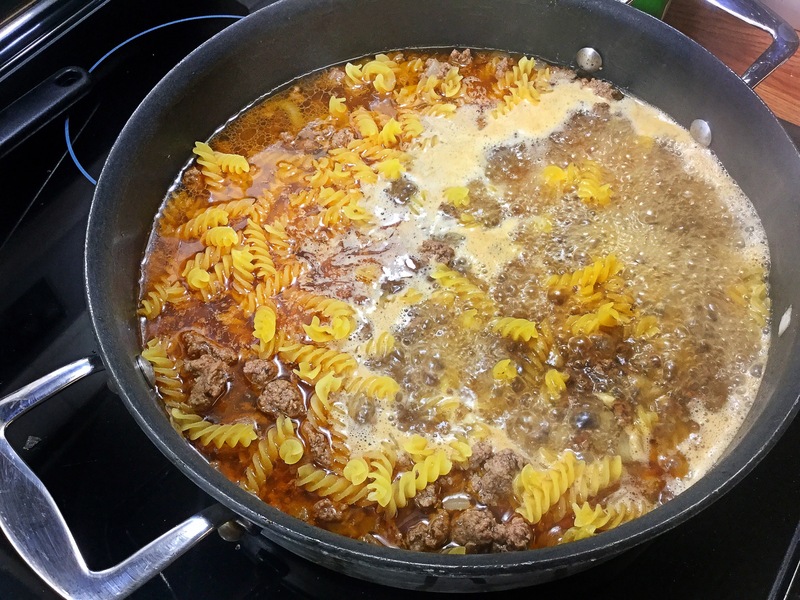 The last hour you will add in the egg noodles to cook through. When time is up, garnish with a bit of chopped parsley,a dollop of sour cream and a nice hunk of crusty bread for dipping…if so desired ;). Enjoy!! Some parts call this a casserole, others call it a hot-dish..but I simply call it goodness! Growing up we ate many a meal where you would add meat, a cream of something soup, cheese and vegetables mixed in and it was always good. However, it was always the same. Same, same, same. 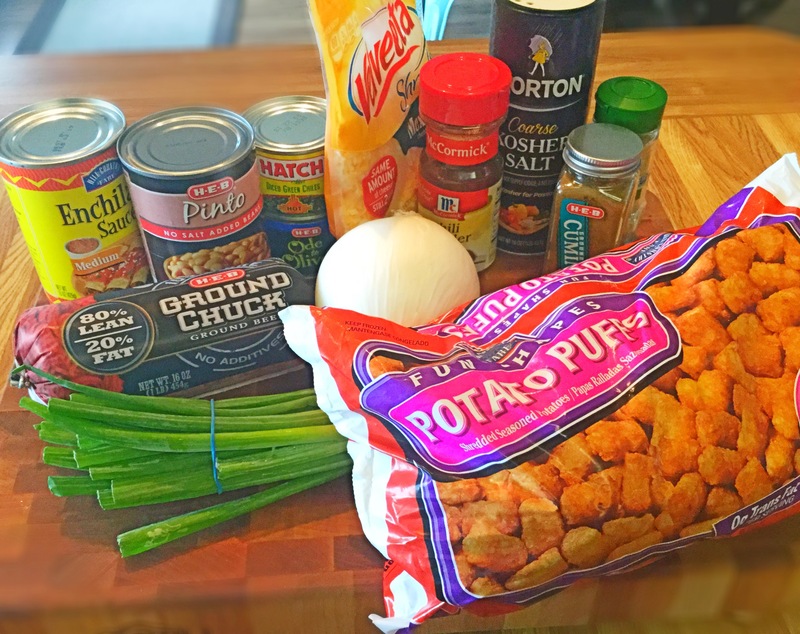 So now that we live in a more foodie inspired world (I know, the word “foodie” would gasp to hear her name in regards to a casserole), I thought we could take the standard, cream of mushroom tater tot casserole, up a notch or 5! Like always, feel free to tweak to your likeness. Swap out the beef for ground turkey or chicken, the pinto beans for black beans and corn, or change up the cheese a bit! Just don’t change it too much or you will no longer have that comforting classic we all grew up with and loved! I used a mix of cumin, chili powder, coriander, mexican oregano, salt, chipotle chili powder and whisked together. Preheat the oven to 375 degrees and spray a baking dish (9×13 or similar) with non-stick spray. Place on top of a baking sheet to catch any sauce drippings or melty cheese! 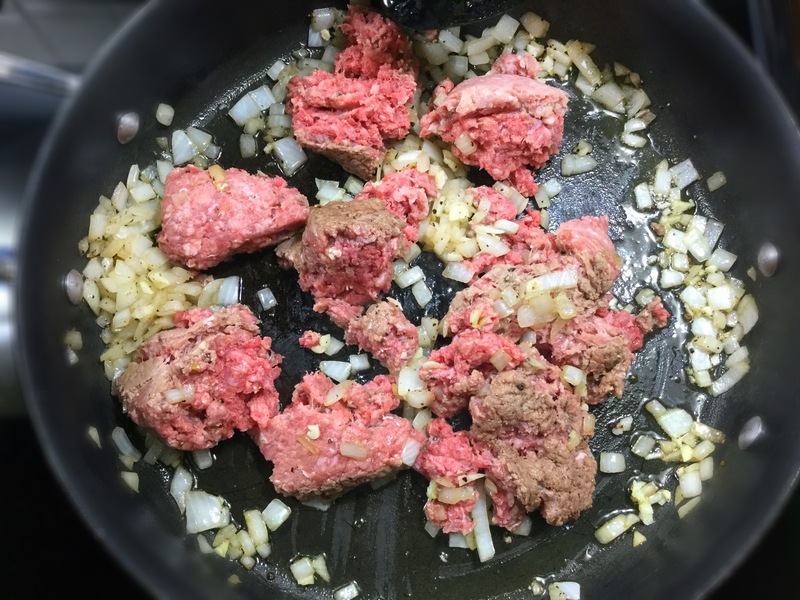 Next, bring a large skillet to medium/medium-high heat and add in the ground beef, chopped onion and the seasoning packet/spices, followed by the minced garlic for the last minute. If necessary drain the grease from here. I, however, used a very lean beef to avoid this one extra step. 😉 Cook through. To that same skillet with the now cooked ground beef, add in the pinto beans, green chiles, half of the cheese and half of the enchilada sauce. Stir to combine and then carefully pour into the casserole dish. Top with them taters! Drizzle the remaining enchilada sauce overtop the taters and place in the oven (uncovered to get crispy) for 40-45 minutes. Time is up, so sprinkle on that last bit of cheese overtop and allow to melt in the oven, about 3-5 minutes. You can even broil it if you like that extra crispness! Once to your liking remove from the oven and allow to rest for about 5 minutes…this thing is HOT!!! One pot! 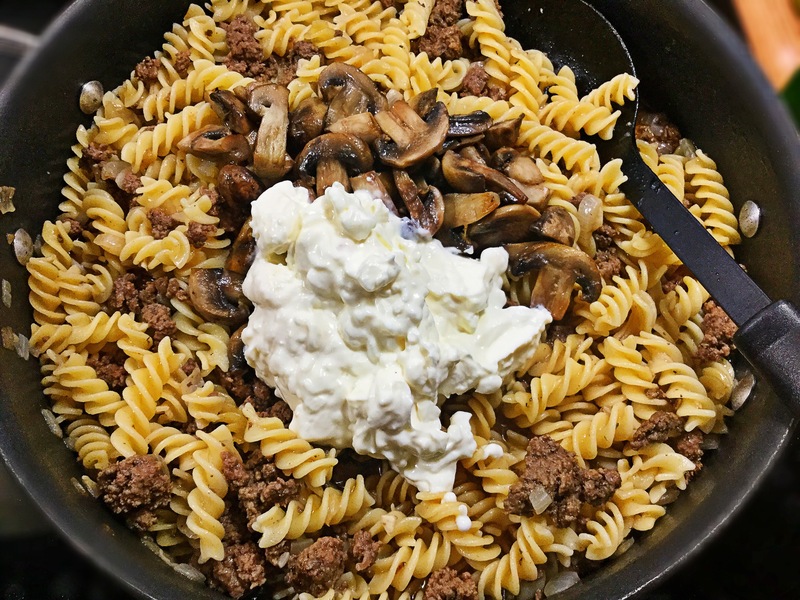 Yep, again, here is a family-filling meal that can be made all in just one pot! Easy cleanup is always an incentive to cook a homemade meal for your family..or at least to me it is. Begin by rinsing and prepping your veggies! Next in a large pan (remember it’s a one pot meal! ), heat 1 tbsp of the extra virgin olive oil to medium heat. 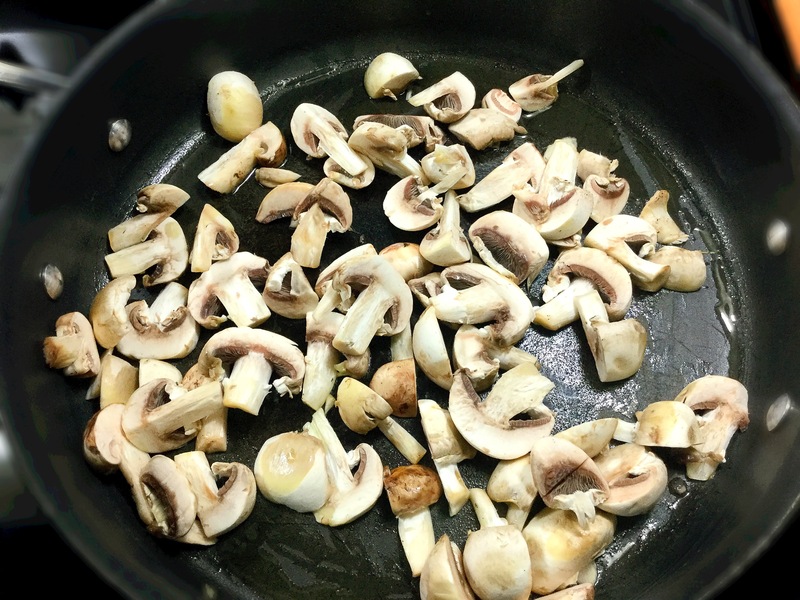 Add in the mushrooms and sauté for 4-5 minutes. Transfer to a bowl and set aside. To that same pot, heat another tbsp of oil and add in the onions and sauté for 5 minutes (till translucent) followed by the garlic for another minute. Now goes in the ground beef, paprika, garlic powder, onion powder, salt and pepper. Cook completely through; taste for more seasoning if needed. If you used a lean ground beef, you likely won’t need to drain excess grease. However, if you used an 80/20 blend (which is perfectly fine) you may need to drain some of that grease out (also perfectly fine). 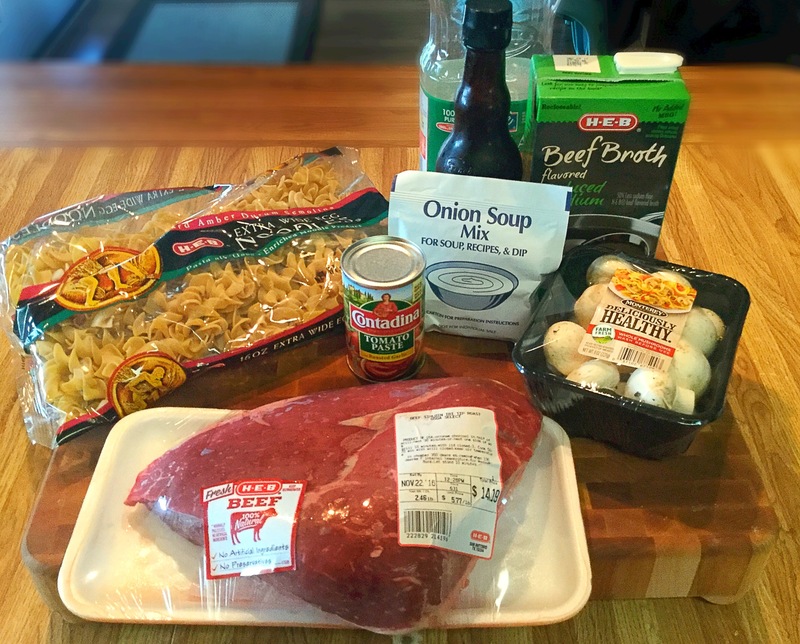 To the cooked beef, add the beef broth and noodles. Gently stir together and bring to a boil. Cover and lower heat to a simmer for 18-20 minutes, stirring occasionally. Finally, remove from heat and stir in the sour cream and mushrooms. Top with fresh parsley and dig in! Enjoy! !